Deng Ai cannot be damaged by red attacks. 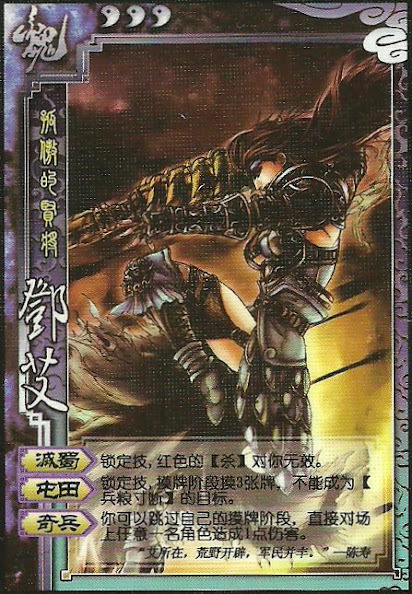 Deng Ai draws an additional card in his drawing phase and cannot be targeted by starvation. Deng Ai can skip his drawing phase to damage any other player. For "Extinguish Shu", all other effects of the attack still take place. "Military Farm" includes of Zhou Yu's "Brave Gesture" and a similar power to Lu Xun's "Humility". If Deng Ai does not have a drawing phase, he cannot use "Rarity".